iTALKonline HTC Desire V Grey PREMIUM PU Leather Vertical Executive Side Pouch Case Cover Holster with Belt Loop Clip and Magnetic Closure Includes Grey Premium 3.5mm Aluminium High Quality In Ear Stereo Wired Headset Hands Free Headphones with Built in Mic Microphone and On Off Button@660 Rs [Mrp:-660] - Onlinedeals.discount - A leading product discovery website. Find the true prices of products, read reviews and buy top brand products at reasonable prices. 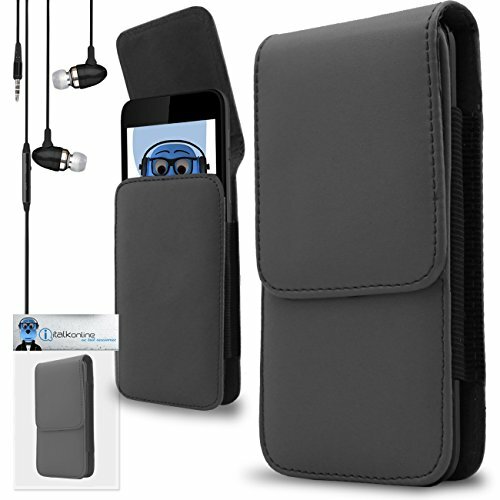 High quality vertical side pouch case with belt clip. Specifically designed for the HTC Desire V unlike ‘one size fits all’ type cases. Magnetic closure to ensure that your HTC Desire V is secure. Material: Premium PU Leather. Complete all round protection for your HTC Desire V.
High quality premium vertical pouch is a padded carrying case with unique design that can be firmly fastened to a belt vertically for the HTC Desire V. Includes Premium 3.5mm Aluminium High Quality In Ear Stereo Wired Headset Hands Free Headphones with Built in Mic Microphone and On Off Button.